As the end of summer looms, shoppers who were just recently filling their shopping carts with fresh meat for their Fourth of July barbecues are looking ahead to the fast-approaching school year – and retailers are preparing for slowing sales. While the dog days of summer and early fall tend to be a low-sales period for grocery retailers, the 2017 season has ushered in a unique set of challenges for fresh meat retail, especially beef. Over the last few months, wholesale beef prices have increased considerably; in late June 2017, the weekly USDA boxed beef cutout was 12% higher than year-ago price levels. 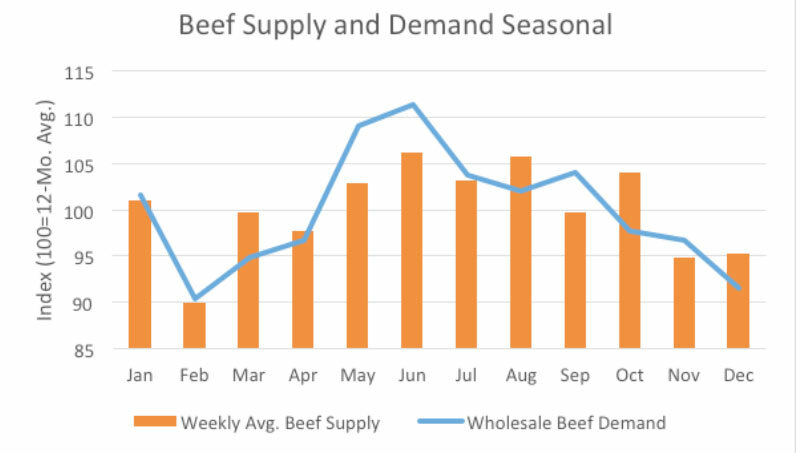 Knowing that the beef supply and demand cycle by season is the first step in determining how to manage the seasonal flux and recent price volatility. Just like summer, supply challenges are short lived, and soon supply will outpace demand, giving retailers incentive to get creative and win back valuable beef sales. As supply increases, there are several steps retailers can – and should – take to evaluate and improve margins during the post-summer grilling slump. Traditionally, beef supply is ramping up in the late summer and early fall, just as seasonal consumer demand is falling. This causes annual price tension at this point in the year, which retailers can proactively address – and need to, in light of recent increased price volatility. • Spring: Demand ramps up with more favorable weather, but supply is slower to respond as producers are preparing cattle for market. • Summer: Demand peaks in early summer as consumers celebrate the three big grilling holidays: Memorial Day, Father’s Day and the Fourth of July, then slows with the late summer heat. Supply is still growing, and generally peaks as demand is on retreat from early summer highs. • Fall: Post-summer and pre-winter holidays, consumer demand is generally weaker. Supply is declining, but the lower trend in production is outpaced by weaker demand. It is too cold for grilling, and back-to-school season has families pulled in many directions. • Winter: Consumer demand begins to pick up, with an emphasis on holiday roasts and beef for stews. Supply is seasonally smaller, but generally adequate for winter demands. Demand for rib-eye and tenderloin can spike higher. With market volatility, it can be challenging for retailers to measure and report out sales success. In the late summer and early fall especially, it’s critical to not only look at how much volume a retailer’s meat department is moving, but to consider how much value the beef buyer is bringing to the whole store. Shopping cart analysis shows beef-buying shoppers are also purchasing produce and dry, durable goods – items the store depends on to pick up margins. Even as a market analyst, it’s difficult to predict market highs and lows – and the stakes are higher for retailers who manage meat purchases. In the face of price volatility, retailers should calculate a price for their beef – and other meat products – that they know will make a good margin. Then, when wholesale prices hit that level, step into the market. Retailers don’t have to buy aggressively, but should increase their buy as the margin incentive continues to widen, which forecasts indicate it will. As we look toward Labor Day, seasonally larger supplies and softer prices will present a key opportunity for beef buyers. The market will see dramatic price reductions on a number of items, particularly middle meat beef cuts (e.g. rib-eye and sirloin) that are popular for at-home grilling. Retailers should begin conversations with their packing and processing partners now to plan ahead for short-term and long-term beef purchases to carry them through the late summer/early fall and, potentially, into the winter and early spring. Today, retailers have the opportunity to think beyond traditional beef product featuring and lean into shoppers’ desire for convenience. Convenience always sells. Retailers might consider delivering beef at extreme value – in large-volume value packs – or create shoppers’ next meal for them by cross-featuring products. It could be as simple as bundling beef with a taco kit or running a beef and beer special for Labor Day. Ready-to-make meal kits with beef can create more sales at higher price points. The price volatility that the beef market has witnessed over the last three years is unique, and the industry is still navigating the price wave to gain a better understanding of what beef supply and demand looks like today and what it may look like in the future. We went through a long period of time, through the early 2000s, where every year a little less beef was available for purchase, concluding in the small cattle numbers and high prices in 2014 and 2015. Now, supplies are growing, but as we’ve adjusted prices to reflect bigger supply, we are gaining some marginal beef customers back and navigating implications on price. While we assess if this volatility represents the “new normal,” what do we know for certain? We will see a steady increase in supply over the next three to five years – and, if historical data is any indicator, a strong, continued demand for Americans’ beloved beef. Lance Zimmerman was raised on a diversified crop and commercial cow-calf and backgrounding farm in northwest Kansas. After graduating from Kansas State University with a bachelor’s degree in agricultural communications and journalism, Lance worked for five years as a marketing manager for Certified Angus Beef LLC. He then earned a master’s degree in agricultural economics from K-State in December 2010. In January 2011, Lance joined CattleFax as an analyst. He was promoted to the protein research and analysis lead in July 2016. Lance’s primary responsibility is managing the CattleFax member database, as well as coordinating the organization’s fundamental research and analysis for the cattle and competing protein markets.